The basic idea of producing fibreboards is the economical use of wood. In fact, all kinds of raw materials with "lignocellulose" base are suitable to produce fibreboards, which consist of cellulose, hemicellulose, and lignin, and which contain big quantity technically utilizable fibre. The economicality of the production is determined by the quantity of fibres technically utilizable and suitable for sheetformation. During the production of fibreboards, what in fact happens is the discomposition of the basic material into fibres, and then comes the production of the new, homogenic structure, the fibreboard form the fibres. In the production process, the explorable fibres play the most important role. The fibreboards come into being with the felting of these fibres. The filted fibrelayer solidifies under the effect of heat, or heat and pressure. According to this utilization area, the fibrecontent and quality of the "Szarvasi-1" energygrass is significant /Table 6/. 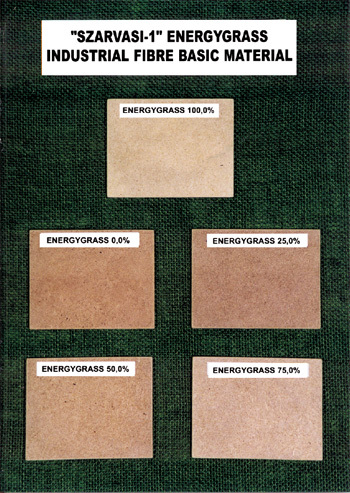 In the laboratory of the Chipboard Factory in Mohács, one-layer, natural, different material-composition fibreboards were made from the "Szarvas-1" energygrass with wet production process /Table 4/, of which the thickness and volumedensity is shown in Table 7. The volumedensity is the most important feature of the chipboards, which are in correlation with all the other board features. The volumedensity of the fibreboards produced from energygrass or form the different mixture of energygrass and wood shows good results compared to the volumedensity of the board made only from wood. The chipboards, or fibreboards of other basic material compositions are indispensable basic materials of covering large surfaces /buildingboards/ in the furniture industry, prefabricated wooden houses, interior design and car industry. The Chipboard Factory in Mohács, as the only chipboard manufacturer, has worked out the development programme of the near future / eg. : HDF and MDF technologies, which serve the modernization of the baseboard manufacturing, high-performance shellacking machines, etc./ with which can belong to the most modern factories in Europe again. Besides developing the technology, the competitiveness could also be improved considerably by representing the cheap energygrass in bigger quantity among the basic materials of the fibreboard production, which is available in short delivery time, and which can also ensure not only the basic material of the fibreboard production, but also the incredibly big energy need of the production process.